If you’re serious about coffee and were to only ever read one book about it, make it this one. James Hoffmann is rightfully famous and popular in the coffee industry for his prose, his perceptiveness, and his uncanny ability to see the big picture clearly. The World Atlas of Coffee has tremendous breadth, covering everything from coffee origins and varieties to roasting and brewing methodology. Somehow James dives deep enough into each topic that the reader learns much of practical value and no topic is glossed over. Even seasoned coffee professionals will learn a lot from The World Atlas of Coffee. It’s a gem. Zingerman’s Deli is a decades-old institution in Ann Arbor, Michigan. It’s so impressively busy and efficient that it has inspired countless other entrepreneurs to copy its approach to food and service. If Zingerman’s had been established in New York or San Francisco, it would doubtlessly be one of the world’s most famous casual food businesses. While the food at Zingerman’s is pretty good (I will warn readers that the coffee is marginal), what sets the business apart is its service. Zingerman’s is the kind of place where you could interrupt any staff member at any time, ask any question, no matter how obscure or annoying, and receive a friendly, well-informed answer. Sometimes I wonder if the staff all microdose some kind of happy drug. Zingerman's Guide to Giving Great Service is a how-to guide to creating a complex, bulletproof service system. Their system manages to tackle every service-related concern imaginable, and once I read the book I understood how their businesses ran so flawlessly. In fact, in a fit of cheekiness, I tested the system at Zingerman’s Roadhouse. I went there alone for dinner (had I brought a friend I think they would have run away mid-meal by what I was about to do.) I was most difficult-but-polite customer I could be. I asked countless difficult, detailed questions about the food, I changed my order multiple times, I complained about the wine, I made special requests, and I generally pushed up against the precise boundaries of Zingerman’s service system in an attempt to get my server to go off script or show some frustration. My server never cracked or showed impatience. At the end of the meal, I left her a massive tip and confessed that I was testing the durability of the Zingerman’s service system. She laughed and said that by the end of the meal she had begun to suspect that was what I had been up to. The bottom line: the system worked and my service was extraordinary. If you’re in service, this book is a must-read. When I owned my first cafe and roastery in the 1990s, I read every decent book I could find about running a business. The one book that stood out from that era was The Fifth Discipline. It introduced me to the concepts of the “learning organization” and systems thinking. Prior to reading the book, I had been feeling a little burnt out from working long hours and had fallen into several ruts. For months after reading The Fifth Discipline I went to work with tremendous energy, inspired to apply what I had learned from the book. The Fifth Discipline reminded me to make business decisions that resonated with my personal values, it inspired me to focus on continual learning, and it helped me focus a little less on finances and the daily routine, and a little more on operating the business in a more thoughtful, fulfilling way. I can’t recommend this book enough to business owners and managers. If one thing separates third-wave coffee from the rest of the industry, it’s the focus on procuring fresh, high-quality green coffee. The early 2000s brought a revolution in standards for green quality and in modern green-buying practices. In my 25-year coffee career, I’ve never met a more competent green buyer than Ryan Brown. Ryan’s palate is, of course, extraordinary, and every cupping session I’ve had with him has been an education for me. But Ryan’s brilliance as a buyer was as much about the strategies and systems he brought to green buying as it was about his cupping prowess. In Dear Coffee Buyer, Ryan teaches the reader invaluable lessons about risk management (e.g. it’s better to buy too little than too much of a coffee), communication (and why it is more important than a world-class palate for procuring great coffee), and strategies to help get green to arrive in good condition, when you want it. He’s also a gifted writer whose skillful prose and stories about traveling to origin keep the reader entertained and engaged. Even if you never plan to be a green buyer, if you work in any capacity in the coffee industry, Dear Coffee Buyer is essential reading. It should be required reading for anyone who buys, roasts, brews, or teaches about coffee. If, like me, you prefer to use a bottomless portafilter to help detect channeling in shots, you need a way to prop the portafilter so the basket is level while weighing and tamping doses. The Decent Portafilter Stand is the perfect solution. To dose precisely with minimal clumping, I recommend dosing into an intermediate container, shaking or banging the container to break up clumps (or if you’re not in a hurry, use the Weiss Distribution Technique) and pouring the de-clumped grounds into the portafilter basket. It’s difficult to pour grounds into the basket without some spillage, but the Decent Funnel solves this problem elegantly. 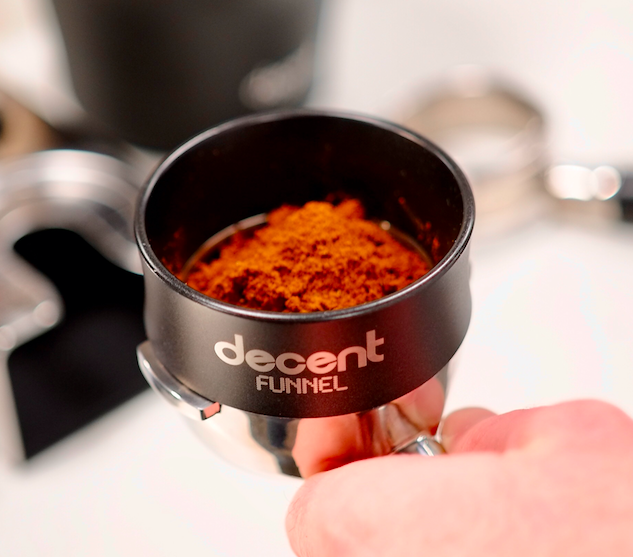 Unlike the unwieldy, ill-fitting jam funnels many baristas use, the Decent Funnel is compact, ridged to lay securely on the rim of a portafilter basket, and weighted for stability. This is my personal favorite Decent product other than the espresso machines. *Note: if you buy three or more products at a time from Decent, shipping is free to anywhere in the world. Decent also sells Dear Coffee Buyer and The World Atlas of Coffee here. My only gripe about the Force Tamper is that grounds frequently build up between the tamping face and the metal disc above it. 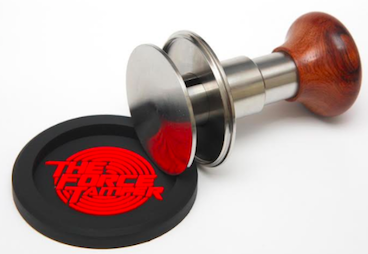 That makes the Force Tamper less appealing for use in a high-volume cafe, but it’s still great for use at home. I’ve been using this scale for over ten years both at home and for travel. It’s tiny, light, cheap ($11 USD), and durable. It’s frankly a more reliable scale than most of the semi-disposable $40—$80 scales baristas use in cafes. The AWS is not waterproof, but I’ve poured plenty of espresso and water on it over the years and somehow it keeps on ticking. Best of all, if you break the scale by dropping it or drowning it in liquid one too many times, you can replace it for a mere $11.